To celebrate World Diabetes Day, this is a guest post “Low Carb For Diabetes”, from an eminent Low Carb Diabetes Educator, Kelley Pounds RN. Kelley is a registered nurse, certified diabetes educator and certified insulin pump trainer that conducts a very successful diabetes education program in her community, specifically working with patients that have been unable to achieve their blood glucose and A1c goals with standard advice (Type 1 and Type 2). See below for details of her diabetes programs. Medical Disclaimer -Before embarking on any change in diet or activity, I highly recommend a physical exam and thorough healthcare screening with your primary healthcare provider. This article should not be construed as medical advice, nor should it be substituted for medical advice from your healthcare provider. By continuing to read this article, you assume all responsibilities and risks for instituting lifestyle management of your diabetes. Many with Diabetes are confused by the conflicting dietary advice they receive. And no wonder. The dietary advice given to those with diabetes has been extremely poor. For decades, people with diabetes have been told center their diet around carbohydrates, many being counseled to consume 250+ grams of carbohydrates per day. No person needs to consume 250+ grams of carbohydrates per day, let alone the very people who are unable to effectively process them, those with diabetes. Eating this much carbohydrates daily would mean that one would HAVE to be consuming a great deal of sugar or refined, processed foods. It would be extremely difficult to consume this amount of carbohydrates while EATING REAL FOOD. Further, many are told “calories from sugar can be substituted equally for other carbohydrates as part of a healthy balanced diet for diabetes.” In other words, you can skip the broccoli or salad for a calorically-equal portion of candy. Really? This advice has not only worsened diabetes and made it harder to manage, it has increased the risk of other chronic conditions, such as kidney disease, heart disease, strokes and cancer as well as contributing to blindness and amputations. Due to the significant correlation between (Pre-Diabetes and) Type 2 diabetes and obesity, people with Type 2 Diabetes are often told to eat a low fat diet, under the mistaken assumption that eating fat, makes people fat. This could not be further from the truth. Eating fat does not make you fat, eating sugar and poor quality carbohydrates does. This is why low carbohydrate diets consistently out-perform low fat diets in weight loss, improvement in blood glucose control and in cardiovascular markers. (1,2). They admit: “Monitoring carbohydrate intake remains a key strategy in achieving glycemic control”. 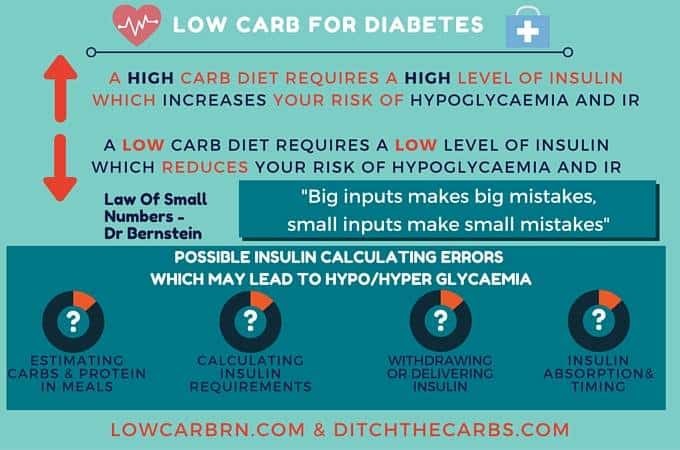 Low carb is essential for those with Type 2 diabetes wishing to achieve normal blood glucose control, to assist in achieving a healthy weight and improve cardiovascular risk factors. Those with Type 2 have two distinct problems going on. First, if the body is still making sufficient insulin, the insulin cannot work efficiently due to a condition called insulin resistance. Second, if the body is not making sufficient insulin, and insulin has to be injected, the injected insulin still cannot work efficiently due to insulin resistance. 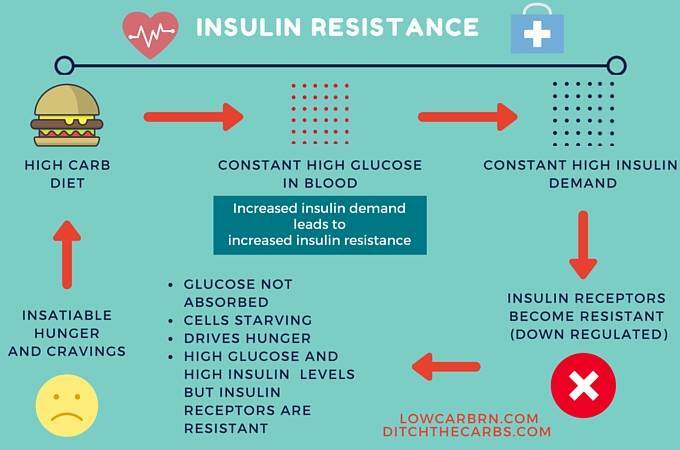 Insulin resistance can become so severe that some with Type 2 can take hundreds and hundreds of units of insulin per day and still not achieve normal blood glucose numbers. The most effective, natural way to reverse insulin resistance is by following a low carbohydrate diet. Therefore, insulin needs will decrease, insulin resistance can be diminished, and the body can heal. This often allows many with Type 2 to decrease or eliminate their diabetes medications. Many with Type 1, when diagnosed in youth, are told not to change the diet. Parents are advised, “just allow the child to eat like a “normal child” and cover with insulin.” Blood glucose and A1c targets are then set SO high so as to insure that the child will not suffer from hypoglycemia (low blood glucose) from the HUGE doses of insulin needed to allow them to eat a Standard American Diet. These high blood glucose and A1c targets leave those with Type 1 open to constantly unstable blood glucose and severe diabetes related complications. A significant number of those with Type 1 can also then develop insulin resistance as well from the high carbohydrate intake, necessitating the use of large amounts of insulin. Low carb is essential for those with Type 1 diabetes wishing to achieve normal blood glucose control. But won’t this leave those with Type 1 open to even more hypoglycemic episodes? Less carbohydrates leads to severely low blood glucose, right? Nothing could be further from the truth. In fact, those using a low carbohydrate approach have much more stable blood glucose, some nearly eliminating hypoglycemic episodes altogether. It really makes perfect sense. Think about it…less (fast acting, blood-sugar-spiking) carbs, less insulin, less hypoglycemia. Why this reasoning is shunned, defies logic. A low carb approach can allow those with Type 1 to significantly reduce insulin needs. The reduced insulin needs and normalized blood glucose can help those with Type 1 to reduce or avoid the risk of diabetes related complications. One major benefit of the low carbohydrate approach is the attention to carbohydrate (and food) quality. A low carbohydrate diet is focused around real, whole foods, including nutrient dense carbohydrates, along with eliminating processed and refined carbohydrates that contain no nutritional value and are not healthy for any persons (even those without diabetes.) And nothing is more delicious than real, whole foods. Not only will blood glucose be normalized, but with a low carbohydrate way of eating, an improved quality of life, vitality, energy and wellness can be expected and achieved. The preponderance of nutritional research points to low carbohydrate eating as the best approach for diabetes. Unfortunately, it is often said that “medical PRACTICE is often 20 years behind medical SCIENCE.” I urge those of you out there with pre-diabetes, Type 2 or Type 1 diabetes not to wait until this is accepted as the standard recommended diet for diabetes. This is my favourite video. 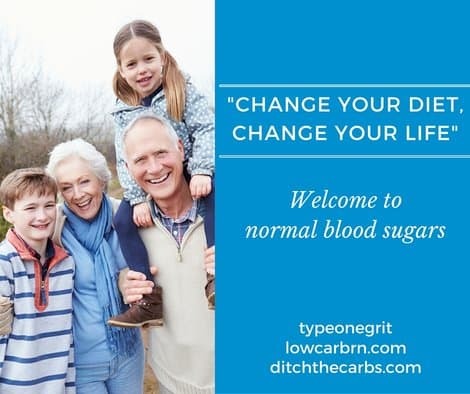 Lisa Scherger, mother of a Type 1 diabetic, and how she has normalised his blood sugar control by ignoring the standard dietary advice for diabetes management – Ditch The Carbs. 3. Professional Diabetes Position Statement – Nutrition therapy recommendations for the management of adults with diabetes. Further reading Dr Bernstein’s Diabetic Solution: A complete guide to achieving normal blood sugars. This is a ‘must have’ book for all types of diabetes. Dr Bernstein believes those with diabetes have just as much right to normal blood sugars as anyone. Diabetes programs – In order to reach a wider audience and help as many as possible to prevent, manage or reverse diabetes, she has recently launched her online diabetes programs. These self directed courses are designed to give you all the tools to successfully manage your diabetes. (One-on-one consultation is also available.) She is interested not only helping those with Type 1 and 2, but also very much so, helping those with pre-diabetes. She feels that the pre-diabetic population is a very overlooked, under-served group that needs significant support with early detection, reversal and prevention. She has used the tools taught in her programs to reverse her own pre-diabetes, lose 80 pounds and rid herself of other health concerns. She would be glad to help you with your diabetes and wellness goals. For more information, please visit her website. TypeOneGrit – join their community Facebook page They are Type 1 and parents who follow Dr Bernstein’s low carb approach to stabilise their blood glucose control. Diabetic University – watch Dr Bernstein’s series of videos to learn how to gain control and achieve normal blood sugars. 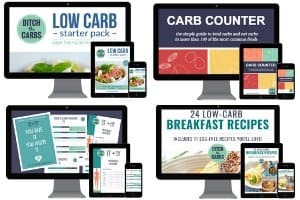 Recipes – for all your low carb recipes which have no sugars, no grains and are wholesome real ingredients, take a look at our recipe finder. When you ditch the carbs, you are opened up to a whole new world of real food. Eating healthy low carb food is an important part of effective diabetes management. Start today and make a change for tomorrow. Videos – take a look at all these videos and lectures on low carb for diabetes. I have been a T1 diabetic for over 53 years with varying levels of control of Blood Glucose. I started the LCHF diet about 6 weeks ago. I have lost 12 pounds and at first I was very stable with BS but here recently I can start at 110 BS eat 2 eggs, 2 slices of bacon and 1 patty of sausage, 2 cups of coffee with only butter in it and go up to 300 on my BS. I take my insulin and fall to low, take a small amount of juice and it rises to over 200. Make no sense to me but I will keep eating the LCHF diet because I feel wonderful on it. I have so much energy and will be talking to my doctor soon. Last time I spoke with her, she had no idea of how the KETO diet would work. I would check what is in your bacon, it sounds like it may have added sugar. Juice is high sugar too. Protein can raise blood sugars, albeit slower and to a lesser extent. Why not join the Type One Grit page. They will help you adjust your life to low-carb/keto and T1 control. This is their page, and they will help you control your diabetes through a low-carb approach. I’d love to take your advice seriously, but when you have a website about quitting sugar and processed foods and allow advertising to interrupt your article from a major chocolate manufacturer with an image of cookies that says click link for recipe….. well you lose credibility. A lot of it. I delete and block those as quickly as I can. I even have filters set up banning junk food adverts, amongst many many other topics. I apologise if the odd one sneaks through, but be rest assured, I do not ask for those types of adverts, and I certainly would NOT advise those types of products, you know me better than that. They are delivered though my network responsively. I will go an ask them to increase the filters, again. Is it supposed to be ‘Hirsutism’ on the symptoms infographic? Thank you for adressing type 1 and type 2 in the same post. Type 1’s may often be so frightened of hypoglycemia that they can’t imagine cutting off regular high carb snacks. Thanks Bob. Kelley has written a fabulous article here. And thanks for the typo spotting, I love your attentiveness. Thank you. I have gestational diabetes, and the carb recommendations are high- my dr. has me eating 10 servings of starches per day. Is it safe for a low carb diet for this condition? I only have about 2 1/2 weeks until my due date, and my blood sugar levels keep creeing up, which means my dr. has to keep increasing my dosage of glyburide. I had GD twice and was induced with both which I would not wish upon anyone. I am not allowed to give advice but I just wish I knew then what I know now. Follow the money if you wonder why misinformation is the norm. If diabetes is “cured”, pharmacies, drug manufactures and anyone else profiting from this disease would be out a great deal of money. I’m a T1 diabetic, managed with an insulin pump, who previously has had very poor control over my BSL’s, at one point I was even insulin resistant. In July this year I had to have my thyroid removed and my mum was talking about this LCHF diet that she was on (I thought she was crazy) but I decided to give it a go, since then, I have lost over 10kg and my BSL control is amazing! Yes, I have fallen off the wagon but I keep jumping back on. When I saw my specialist last, he said whatever you are doing to keep on doing it, because it is working! It’s amazing how something so simple can make such a big change! I’ve been LCHF for around 15 months now and have seen improvements in many areas of my health. The first was lower blood pressure after 6 months. I came off my tablets and my resting heart rate was down to 50, blood pressure very good. My hbA1c result after around 8-10 months was classed as non-diabetic – the first time I think I’ve had that in 31 years of type 1 diabetes. In terms of fitness, I’ve always been extremely active (gym and football), but I’ve not seen any drop in energy or strength through using fats as my energy source rather than carbs. My body fat % has dropped too as a result. I am lucky that my GP is open minded and was not critical of the changes – especially with the results. A big change is recovering from hypoglycemia. Before I’d have had a half bottle of lucozade (200-300ml) and then had the yo-yo blood sugar range for some time afterwards. Now, even if my blood is 2.0mmol/l, I can have one apple or banana and be fine within 5-15 mins. I would also say I am more compos mentis with lower blood readings than before too. I would recommend it to other diabetics, but you have to be careful in the early stages to ensure you do not suffer bad hypoglycemia episodes – easily done. I would encourage gradual change, don’t go cold turkey on carbs straight away as it will take your body time to adjust – you will feel deprived of energy too in the early stages when your body adjusts. For some it may not work, but for many it could be a life changer for the better. I completely agree. I’ve done a mostly keto and low carb diet for over a year, and have lost nearly 20 lbs. I’ve had type 1 diabetes since 1990, and I am ashamed that it took me this long to finally take control and cut the cheap crap out of my diet for good. Congratulations Meghann! Great job! I too was able to lose a significant amount of weight and normalize my blood sugar, reversing my pre-diabetes. This approach is so effective for all types of diabetes. Hearing your story is so encouraging! Thank you so much for sharing! Sorry… to continue above email. After a series of glucose daily testing rituals (early morning; before lunch and dinner; 1 and 2 hours postprndial), I now take 1/2 of methformine before going to bed. I plan to test myself again to pull away taking the metformine and totally declare me as having reversed by type 2 diabetes. I wish to get inputs from anybody please. Thank you. Some sense in the madness and good advice in a world of bad dietary advice and world gripped in a obese epidemic. Thank you. I love this article and would like to provide a link to it on my website. Absolutely Joanne. We would be honoured.